Jump over gaps and dodge witches and ravens around. Get credits and set the best score. 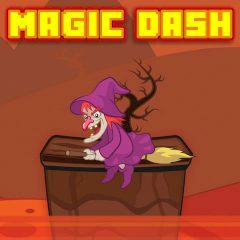 Are you ready for a magic dash? Jump over gaps and try to collect all bags and coins that enemies drop. Don't get in a traps of your greed and dodge ravens and witches that are near your treasures.